WTH?! (What the Heck?) moments are attempts to find the memorable and the off-beat perspective on Longhorns sports. Here are some interesting moments from the Texas’ game against the Rice Owls. 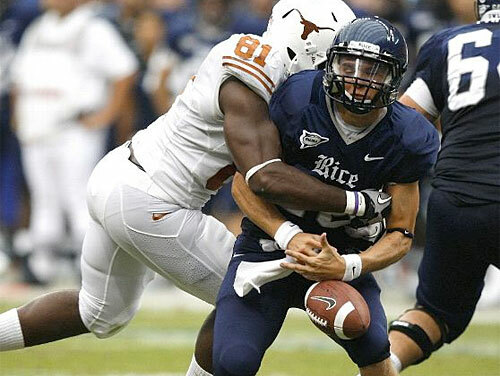 Sam Acho sacks the Rice QB causing a fumble. Pregame (15:00) WTH Sherman Williams?! Did your paint truck have an accident on ESPN sideline reporter Jeannine Edwards shirt? Wow…I have no fashion sense but that outfit was almost as loud as the announced attendance of 70,445 at Reliant Stadium. 1st Quarter (6:56) WTH Jones?! I can understand avoiding the dangerous kick returners that we have on the team. But watch out for our secret weapon DE returner Eddie Jones who led all Texas kickoff returners with 41 total yards. 2nd Quarter (14:48) WTH Duran RD 1?! Looks like the Hands of Stone hit the UT secondary. Cornerback Chykie Brown dropped a sure interception for a touchdown when the ball was thrown right at him. Can we say that the SI Jinx has now been applied? 2nd Quarter (7:56) WTH Cowboy?! Kenny Vaccaro was furious on consecutive plays when he lit up Rice running back Tyler Smith. How many star tattoos do you have on your arms? Special shout out to Keenan Robinson who with the help of defensive end Sam Acho turned the tables on Rice with a sack and return for a touchdown. 2nd Quarter (:04) WTH Replay Booth?! What is up with that extraordinary blooper pass completion to Rice WR Randy Kitchens that resulted in one of the two touchdowns that Rice would score? Come on CUSA officials, you could not tell me that his legs were touching before he even tried to extend the ball. Did the ball even cross the goal line? Even the television shot of Rice Coach David Bailiff showed he was surprised by the outcome. Halftime WTH MOB?! Lost another halftime show. Prediction sure to come true that we will lose the last game of the year too! It was great to see the “oldies” volunteering to march with the band to fill out the roster. 3rd Quarter (8:55) WTH Duran RD 2?! UT cornerback Aaron Williams dropped a sure touchdown as the secondary brought their stone hands to the game. Thank goodness he did not muff a punt return…oh wait. 3rd Quarter (3:42) WTH Newton?! It is amazing how a shifty running back who finds creases makes the offensive line blocking look so much better. RB Tre Newton clearly has established himself as the lead back with his third touchdown. With Newton, Fozzy Whittaker and Cody Johnson the team ran for just under 200 yards. It was good to be stubborn against the Feisty Night Birds but when the real season starts lets mix up the play calling to help open up the run. 4th Quarter (3:40) WTH Duran RD 3?! Aaron Williams will be an all conference player at the end of the season for his defense, but he will not win many special team awards if his decision making ability does not improve. His muff punt return allowed the Owls to tack on another touchdown to make the score look better. Next up for the Longhorn’s are the Cowboys from Wyoming at 6pm on Sept. 11th. Thanks for following my WTH articles throughout the season. I appreciate the opportunity to rant about the greatest University sports program in the country. You can continue to follow comments on all of UT sports on twitter at 40 Acres Sports or follow me at Horns1991. HOOK EM! !